Today, they tore out the trees at my dad's old house. 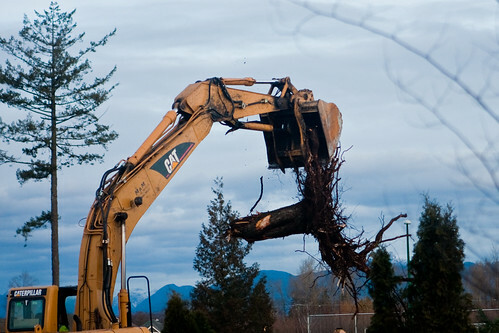 A part of me was happy to see that big tree go, because it always gives me such terrible spring allergies. A larger part of me was sad. My mom loved looking at that tree. 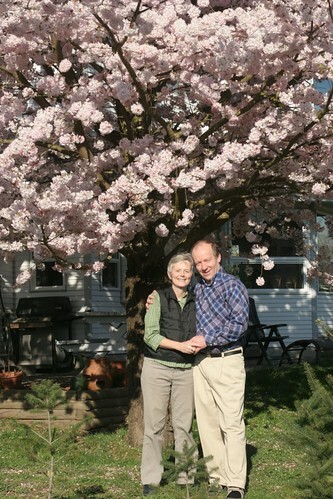 The last time my mom went outside for a picture was in April 2006, to get a picture by the tree. (Taken April 4th 2006, she passed away on May 7th 2006). One nice thing is that we have a beautiful view of the mountains right now...until they put the 6 new houses on that lot. Miss you mom. Always. Every day. Everytime I see pictures of your mom, I think "wow she is so beautiful!" It's her smile, so joyful, you can tell your Mom loved and was loved. i love this pic and that tree. she didnt look too bad there did she? oh boy, better not think too much about it..pregnancy hormones! sure Jon, blame the 'pregnancy hormones'. Man - dad looks...different in that photo, eh? Hmmmm ;). Ya. that tree definitely bring back memories for me, too.